The symptoms caused by enlarged adenoids are mostly due to where this lymphoid tissue is located. 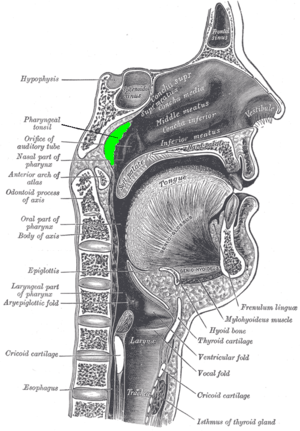 The adenoids are in the midline of the nasopharynx, and the Eustachian tubes open from either ear to the right and left of them. In children with excessive middle ear infections and chronic middle ear fluid, there is a high bacterial count in the adenoids as compared to children without problematic otitis media, even if the size of the adenoids is small. The adenoids in these cases provides a reservoir of pathogenic bacteria that cause ear infections and subsequent middle ear effusions (fluid). There is some low quality evidence suggesting that mometasone may lead to symptomatic improvement in children with adenoid hypertrophy. Surgical removal of the adenoids is a procedure called adenoidectomy. Carried out through the mouth under a general anaesthetic, adenoidectomy involves the adenoids being curetted, cauterised, lasered, or otherwise ablated. Adenoidectomy is most often performed because of nasal obstruction, but is also performed to reduce middle ear infections and fluid (otitis media). The procedure is often carried out at the same time as a tonsillectomy, since the adenoids can be clearly seen and assessed by the surgeon at that time. ↑ Chohan, A; Lal, A; Chohan, K; Chakravarti, A; Gomber, S (13 July 2015). "Systematic review and meta-analysis of randomized controlled trials on the role of mometasone in adenoid hypertrophy in children.". International journal of pediatric otorhinolaryngology. 79: 1599–608. doi:10.1016/j.ijporl.2015.07.009. PMID 26235732. Gates G (1996). "Sizing up the adenoid.". Arch Otolaryngol Head Neck Surg. 122 (3): 239–40. doi:10.1001/archotol.1996.01890150017004. PMID 8607949. Kenna, Margaret A.; Bluestone, Charles D.; Stool, Sylvan E. (1996). "Chapters 58–59". Pediatric otolaryngology. 2. Philadelphia: Saunders. ISBN 0-7216-5248-4.